When writing a cover letter (as you should do each time you submit a resume as part of a job application), the layout of your letter is very important. Layout refers to the way the words are set up on the page, including headings, spacing, and font. You want to use a layout that makes your letter both easy to read and professional. When laying out a cover letter, you want to follow the layout of a typical business letter. A business letter begins with your contact information, and then the employer’s contact information. It's important to properly space the layout of the cover letters you send, with space between the heading, the greeting, each paragraph, the closing, and your signature. Single space your letter and leave a space between each paragraph. Also, remember to left-justify your entire letter. When selecting a font, use a simple font like Arial, Verdana, Courier New, or Times New Roman. Your font size should be no smaller than 10-pt. but no larger than 12-pt. In choosing your font size, 12 pt. is probably the best – you don’t want to irritate a hiring manager by making him or her have to squint to read your font. The cover letter template below shows the layout for a typical cover letter. 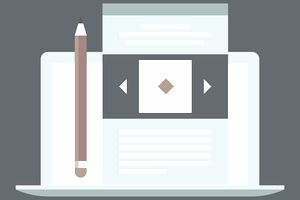 Use the template to structure your own cover letter. It will give you advice on how to space your letter, what font to use, and how to justify your page. The template also briefly describes what kind of content should go in each paragraph. Use this information to help you begin writing your own letter, tailored to reflect your own career history, professional qualifications, hard and soft skills, and your knowledge about the job and employer to which you are applying. You can also review examples of cover letters for advice on how to word your cover letter. When using a format or a sample letter, remember to be flexible. You can add or remove paragraphs to fit the needs of the particular job description. Also, keep in mind that your best strategy is to write a customized cover letter for each job to which you are applying. Hiring managers can tell when they’ve been sent a generic cover letter; they are more likely to be interested in candidates who have taken the time to write unique letters that specifically address the job opening they are offering. The first section of your cover letter should include information on how the employer can contact you. If you have contact information for the employer, include that. Otherwise, just list your information. This section should be single-spaced and left-justified, with a space between your contact information and your employer’s contact information. I was excited to find the Customer Service Representative position on the Careers page of the Belview Electronics website. I believe I would be a good fit for your company because I have all of your required qualifications, as well as extensive experience in customer service and the electronics industry. I have a bachelor’s degree in computer science and I am fluent in both English and Spanish. In addition, I worked as a customer representative for a local plumbing company while I was in college. I have excellent phone skills and the ability to multitask. In addition, I am well organized, and proficient in most word processing and spreadsheet programs. My schedule is very flexible and I would be happy to work evenings or weekends as necessary. Thank you so much for your consideration. I’ve included my resume so you may further review my qualifications for the position. My cell phone is 555-555-5555 and my email is myname@myemail.com. I look forward to hearing from you so we can arrange an interview.